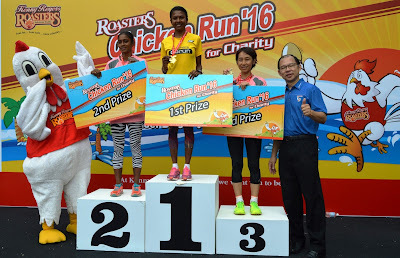 Last Sunday, 22nd May, 2016, Mommy Jane brought Little Angels to the 12th ROASTERS Chicken Run ("RCR") organised by Kenny Rogers ROASTERS ("KRR") together with more than 2,138 runners converged on Desa Waterpark. Mommy Jane woke up at 5.30 a.m. while Little Angels woke up at 6.10 a.m. as we eager to join the run. After some packing, we started our journey at 6.30 a.m. and reached Desa Waterpark at 7 a.m. When we reached, there are already lots of participants waiting there. Some came as early as 6.30 a.m. At around 7.15 a.m., we were greeted by a warm-up session by Celebrity Fitness before all of us proceeding to run according to our respective categories. Participants of ROASTERS Chicken Run during the energetic warm-up session thanks to the Celebrity Fitness team! "The ROASTERS Chicken Run has been one of our significant events in our calendar. The success of this event can be seen by the response it continues to receive in its 12th year. Seeing the supports Malaysians are throwing our way, gives us a sense of satisfaction to see that our objective of promoting healthy living, while giving back to the community has been achieved," commented Dato' Francis Lee, Group Executive Director of Berjaya ROASTERS (M) Sdn Bhd. "Through the amount of RM55,000 raised from the event, we are glad to share that KRR will be reaching to a larger number of the needy ones by providing them nutritious wholesome meals as well as donating funds to various organisations through Food Aid Foundation," added Dato' Francis Lee. Funds from the ROASTERS Chicken Run 2016 will be handed to Food Aid Foundation through 2,000 sets of Kenny's Chicken Meals to approximately 20 charitable homes for both the young and old while the remaining funds will be utilised to purchase ingredients and groceries to other home which are also supported by Food Aid Foundation. "I'm glad to be here today to show my gratitude and support to this meaningful event. We appreciate the generosity from KRR and fellow Malaysians, who are selflessly here with us today in support of the foundation. With the contributions garnered from the event, we will certainly be able to extend our arms to a greater number of homes and provide them with more nutritious food supplies," expressed Rick Chee, founder of Food Aid Foundation, at the charity run yesterday. Dutch Lady Chocolate, Original and Coffee taste we given out for free too. RCR has raised over RM660,000 for a myriad of charitable organisations and homes such as Little Yellow Flower Foundation, Tabung Kebajikan Pesakit HUKM, Pediatric Unit HUKM (Oncology), Unit TUTUR - Aural Rehabilitation Centre or Hearing Impaired CHildren together with Yayasan Budi Peyayang Malaysia and House of Joy and Faith, Yayasan Sunbeams Home, Rumah Juara, Rumah Kanak-kanak Tengku Budriah, Rumah Sayangan, Malaysian National Kidney Foundation - Dialysis Treatment for the Young, Rumah Hope, Rumah Kebajikan Anbu Illam, Rumah Charis Ti-Ratana Welfare Society and Tabung Kebajikan Pesakit PPUKM - Young Diabetic Patients. 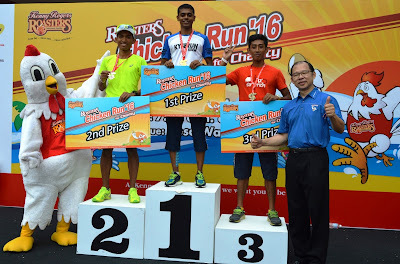 ROASTERS Chicken Run 2016 was supported by their official venue partner, Desa Waterpark and supported by 100 Plus, Brooks, BCard, Berjaya Hotels & Resorts, Celebrity Fitness, Unilever Food Solutions, Starbucks, Sports Toto, Krispy Kreme, The Sun, Salonpas, RockTape, Dutch Lady, The Cocoa Trees, Fresh N Sqz, Super Asia, Delphi and Nestle. Established in 2005 in aid of the less fortunate, the ROASTERS Chicken Run is one of the many initiatives in the Kenny Rogers ROASTERS Community Chest Campaign. For more information, please call 03-21199888 or visit www.krr.com.my or connect to www.facebook.com/krrmalaysia. Mommy Jane was very happy to be part of this charitable run. 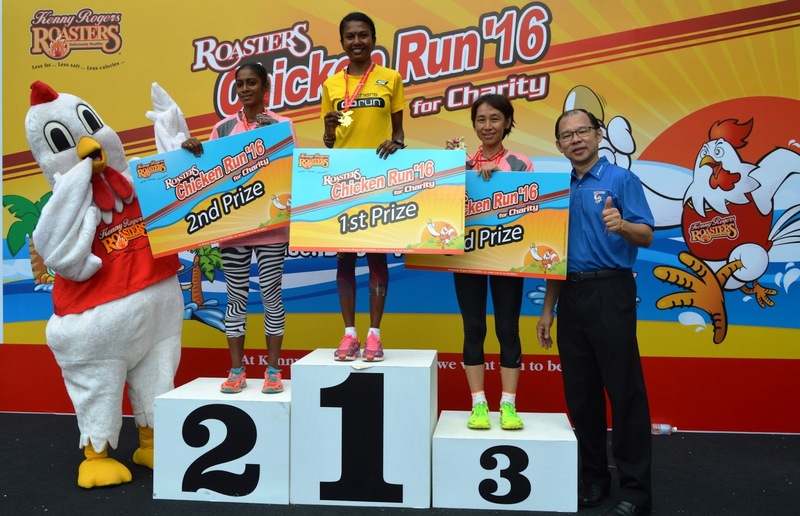 Thumbs up to Kenny Rogers ROASTERS who had raised up funds of RM55,000 through the run to Food Aid Foundation and Charitable Homes to ensure all the unfortunate had enough to eat. Thanks for the invitation to create awareness to my Little Angels on the importance of giving. It was a great event where children and adults joined hand together to be part of the run with family and friends while doing their parts to the society. Hope can join again next 13th chicken run. That's one way to stay healthy with the family while doing a good deed! Way to go Mommy Jane!! wow!!!Awesome!! !meaningful event!!! the last pic so warm and nice!!! Bearhy, a great event while contribute to the society. Everyone was happy. So cute this event hehee Chicken run, lolx! Great effort to the organizer to have this event that is family-friendly! Sharon, now getting bigger and better. You should join it next year. Sure can see lots of improvements. Really looks fun joining marathon like activity. Really feel more happening having fun moment with family and friends. Apple, indeed it is. Every children and adults were happy. Fun run I would say. It is great to run and enjoy with family n friends.